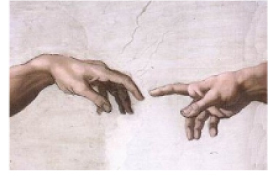 Students will be introduced to the art of Renaissance artist Michelangelo, and will recreate an excerpt of his Creation of Adam from the ceiling of the Sistine Chapel. This free lesson plan is in fulfillment of Standard #4: K-4 and Standard #4: 5-8 of the National Standards for Art Education: Understanding the visual arts in relation to history and cultures. Tell students, "We will be learning about the art of Renaissance artist Michelangelo. This artist created some of the most memorable works of art from the Renaissance era, and is known particularly for his ability to draw, paint, and sculpt the human form." Show images of the Sistine Chapel, and Michelangelo's sculpture of David. Tell students, "Our art project will be to recreate Michjelangelo's Creation of Adam. Show students image of excerpt of Creation of Adam. Tell students, "At your tables you will find butcher paper, pencils, and a reproduction of the Creation of Adam. Begin by sketching this painting on your butcher paper." Tell students, "At your tables you will find butcher paper, pencils and a copy of the Creation of Adam. Begin by sketching this painting on your butcher paper." Tell students, "In order to get a sense for how Michelangelo worked while painting the Sistine Chapel, we will be taping our drawings to the bottom of our tables and painting them as if the drawings were on the ceiling of the chapel." Parents/teachers may want to use benches and/or ottomans as scaffolding for this project. Tell students, "Tape the drawing to the bottom of the table, place your scaffolding in position, and paint." The students will lay on the benches as the paint their project. Tell students, "Begin by mixing your skin color. Use lots of red and a little yellow. You can even add a little blue to give the paint a grayish tone. Begin painting." As the students work, you can quiz them on a few facts about Michelangelo.